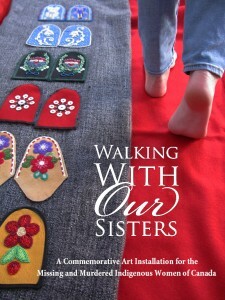 The Walking With Our Sisters Exhibit will open to the public on October 2, 2013 at the University of Alberta in Edmonton. For anyone not familiar with this exhibit, it originated with Métis artist Christi Belcourt, who was looking for a way to raise awareness about the 600+ missing or murdered Indigenous women in Canada. Her original plan was to have 600 moccasin vamps (uppers) made to symbolically represent these women. She sent out requests to the community to see if anyone would be willing to donate vamps to this project. The response to her call has far exceeded her expectations. The final number of vamps that have been created and donated to the project is now 1,723. This overwhelming response is a testament to the impact violence against women has had on Indigenous communities, not only in Canada but in the United States and other places around the world. This is not the first time that survivors of abuse have been asked for evidence in this way, there is plenty, unlike them, i have followed this for years, in touch with many, read testimonials, accounts, and watched events to highlight this, recently there was a massive case published, so do your own homework holliegreig justice, whose mouthpiece tho law breaking is left alone, for some strange reason, hopefully to fully expose, later. I have posted this to show your low tactics up. i am ashamed of the comment by a charlatan fake group UK. At the moment, some that have investigated have all been attacked and defamed, well i should say attempts are made, and when they can’t shut me or others up, they attack other people around us. This is part of a backlash on me, i can only apologise that it has spilled onto you.